Southern Resident killer whales are unique and iconic to the Pacific Northwest. They are also among the most endangered marine mammals in the world. Researchers have identified three main threats to the recovery of Southern Residents: 1.) availability of prey, 2.) vessel noise and traffic, and 3.) chemical pollutants. Unlike transient killer whales that prey on marine mammals such as seals, Southern Residents prey on fish. Like all killer whales, Southern Residents use echolocation, a process of producing short sound pulses that bounce off objects to detect and identify things in the water, including their preferred prey, Chinook salmon. But vessel traffic can disrupt the whales’ behavior and radiated noise from vessels can mask echolocation signals the whales use for hunting. This crowded and noisy environment can make it more difficult for hungry whales to find and catch their prey. For the past several years, we have been working to better understand the effect that vessel traffic and underwater noise is having on individual whales. We have done this by placing suction-cup tags on several members of the Southern Resident population. 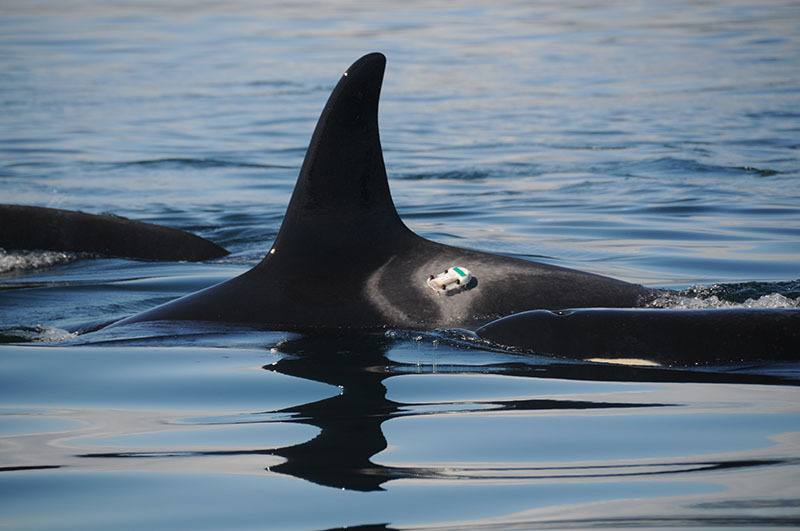 These digital acoustic recording tags, or DTAGs, contain two underwater microphones to record sound along with pressure, accelerometer and magnetometer sensors that allow us to re-create whale movement , much like an activity tracker in your watch or smart phone. When whales were tagged, we collected GPS data on all nearby vessels and took observations of the whale’s feeding behavior. When possible we also collected any scraps left behind after a feeding event to better understand how the whales make their catch and what they are eating. Unsurprisingly, the DTAGs measured higher noise levels when there are more vessels around and when the vessels are moving fast . The frequencies of sounds emitted by vessels overlapped with the echolocation frequencies that the whales use to hunt fish. Additionally, we could differentiate different foraging activities from the acoustic and movement record, including when the whales used echolocation signals to search and pursue fish, fast rolls and jerks during fish chases, and the detection of crunching sounds from eating after fish kills. These results allowed us to identify different phases of foraging and determine how vessels and/or noise affect the whales’ behavior and their ability to catch fish. This work, along with a comparative investigation involving DTAG data from Northern Resident killer whales, a fisheating population that is growing steadily, is improving our understanding of these killer whale populations. This improved understanding is informing killer whale conservation and management measures, including assessing the effectiveness of vessel regulations for killer whales in the U.S. . Additionally, the Pacific Whale Watch Association’s updated guidelines include a slow zone around killer whales because recent research showed that speed is the biggest factor in how much noise reaches the whales. Science is informing real change for the benefit of the whales. Figure 1. (Attached file “20100921CKE_DG1_269”) A Southern Resident killer whale with a suction-cup attached DTAG. Photo taken by Candice Emmons under NOAA NMFS issued Research Permit No. 781-1824. Fig 2 Video: (above image is placeholder, Attached File “sept22-K33 v1.mov”, Quicktime Movie ). Legend can read, “An animation of the track of a tagged whale and all of the boats around it during an entire tag deployment. 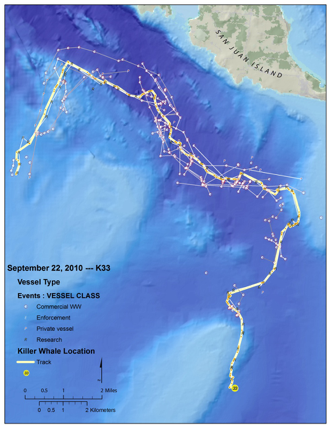 The whale track is shown by the thicker pale yellow line and each vessel track is connected by a thin line.” Animation prepared by Damon Holzer of NOAA Northwest Fisheries Science Center. M. P. Johnson and P. L. Tyack, “A digital acoustic recording tag for measuring the response of wild marine mammals to sound,” IEEE Journal of Ocean Engineering, vol 28, pp. 3-12, 2003. M. M. Holt, M. B Hanson, D. A. Giles, C. K. Emmons, and J. T. Hogan “Noise levels received by endangered killer whales Orcinus orca before and after implementation of vessel regulations” Endangered Species Research, vol. 34, pp. 15-26, 2017. G. A. Ferrara, T. M. Mongillo, and L. M. Barre “Reducing disturbance from vessels to Southern Resident killer whales: Assessing the effectiveness of the 2011 federal regulations in advancing recovery goals.” NOAA Technical Memorandum NMFS-OPR-58, 76 pp. 2017.